Originally posted over at The Green Man Review! I love peanut butter, I love chocolate, I love caramel. And I really dig Reese’s Pieces. But Outrageous is less the sum of its parts. And that’s a real shame. The bar has a nice weight to it, and the look reminds me of a Baby Ruth or 100 Grand. But instead of peanuts or crisped rice, Outrageous uses mini Reese’s Pieces to surround a core of Reese’s peanut butter coated in caramel. It’s covered in the usual milk chocolate you’d find in a Reese’s cup, and it was fun to bite “sideways” and get a chunk of chocolate and mini’s. But this bar can get messy. My first bite sent several minis falling onto the table, along with some mini-sized pieces of chocolate coating. There doesn’t seem to be quite enough caramel to hold things together, though the caramel does stretch out nicely from the bar with each bite. Then it hit me; there was too much mini, not enough ensemble cast. Sure, I could see caramel. I could see chocolate. And every so often I could see that peanut butter core, though it’s much too small to make any kind of impression – I had to dig around with a mini-fork to try to get a taste of it. 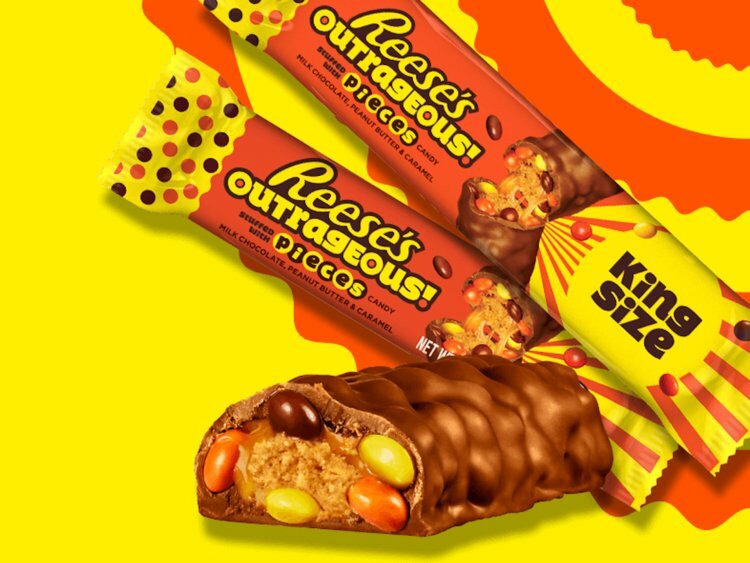 This is more a Reese’s Pieces bar than a melding of ingredients. Because minis make up the majority flavor profile (90% of the time that’s all you’ll taste), it also extremely sweet. The minis are front and center, but all the sugar from the caramel, core and chocolate hit the tongue after a few chews, leaving my stomach unhappy after a few bites. My brain threatened sugar-rush headache as well, leaving me slightly nauseated and unhappy with the whole experience. I can’t imagine finishing the entire bar in one go. In fact, I’d much rather have each item separately, or simply wait for them to re-issue their vastly superior Reese’s Nutrageous bars that has peanuts instead of minis. I suggest you do the same. This entry was posted in General Mayhem. Bookmark the permalink.